The early morning hours of May 6 were moonless when grains of cosmic dust streaked through dark skies. Swept up as planet Earth plows through dusty debris streams left behind periodic Comet Halley, the annual meteor shower is known as the Eta Aquarids. This inspired exposure captures a meteor streak moving left to right through the frame. Its trail points back across the arc of the Milky Way to the shower's radiant above the local horizon in the constellation Aquarius. Known for speed Eta Aquarid meteors move fast, entering the atmosphere at about 66 kilometers per second. 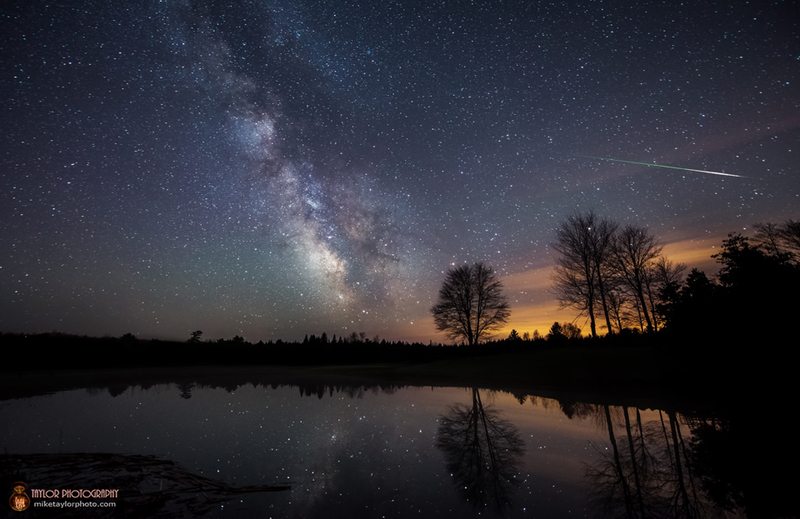 Still waters of the small pond near Albion, Maine, USA reflect the starry scene and the orange glow of nearby artificial lights scattered by a low cloud bank. Of course, northern hemisphere skygazers are expecting a new meteor shower on May 24, the Camelopardalids, caused by dust from periodic comet 209P/LINEAR. 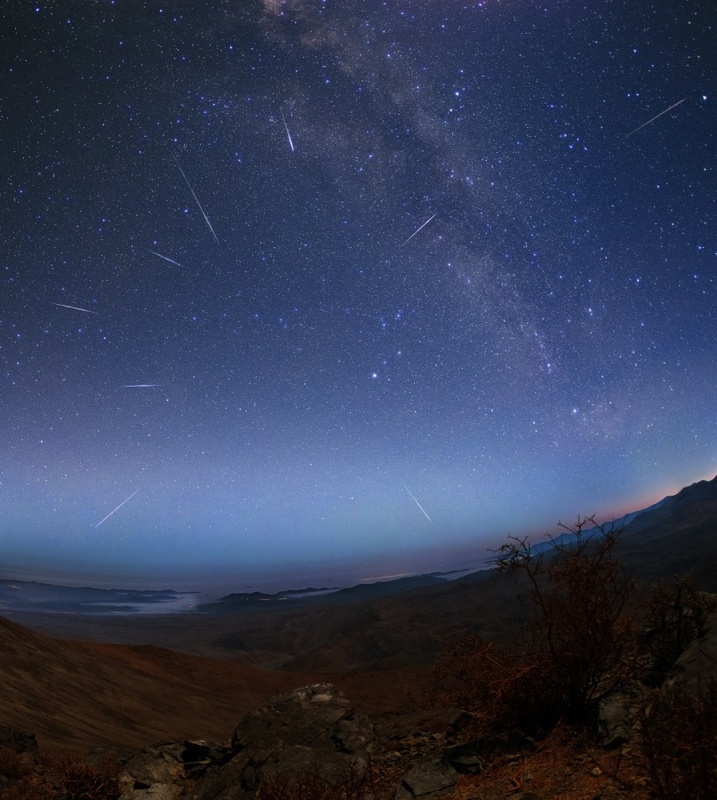 Earth's annual Lyrid meteor shower peaked before dawn on April 22nd, as our fair planet plowed through dust from the tail of long-period comet Thatcher. Even in the dry and dark Atacama desert along Chile's Pacific coast, light from a last quarter Moon made the night sky bright, washing out fainter meteor streaks. But brighter Lyrid meteors still put on a show. 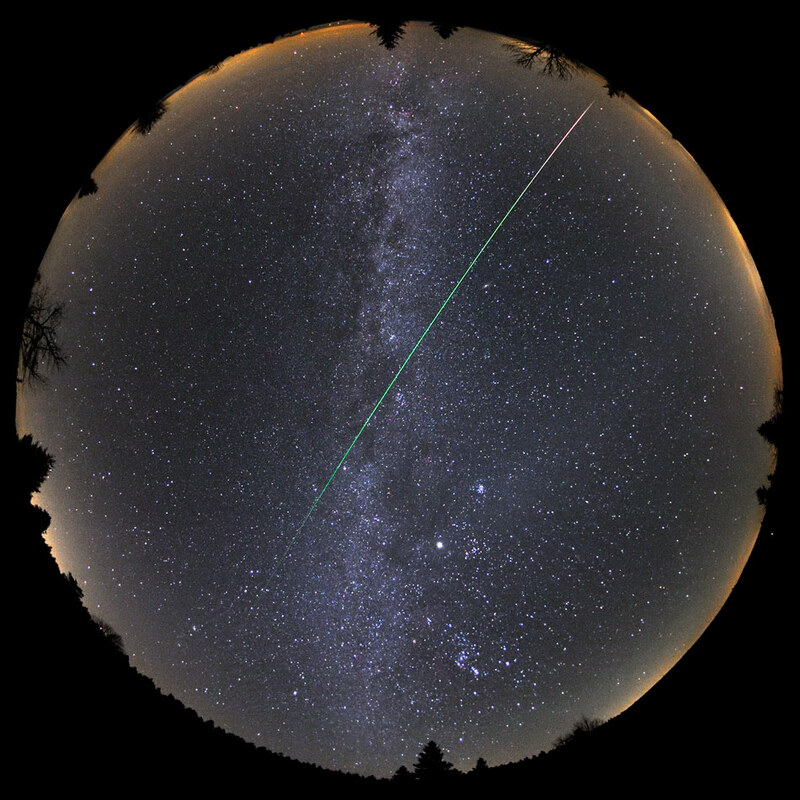 Captured in this composited earth-and-sky view recorded during early morning hours, the meteors stream away from the shower's radiant near Vega, alpha star of the constellation Lyra. The radiant effect is due to perspective as the parallel meteor tracks appear to converge in the distance. Rich starfields and dust clouds of our own Milky Way galaxy stretch across the background. On some nights it rains meteors. Peaking two nights ago, asteroid dust streaked through the dark skies of Earth, showering down during the annual Geminids meteor shower. Astrophotographer Juan Carlos Casado captured the space weather event, as pictured above, in a series of exposures spanning about 2.3 hours using a wide angle lens. The snowcapped Teide volcano of the Canary Islands of Spain towers in the foreground, while the picturesque constellation of Orion highlights the background. The star appearing just near the top of the volcano is Rigel. Although the asteroid dust particles are traveling parallel to each other, the resulting meteor streaks appear to radiate from a single point on the sky, in this case in the constellation of Gemini, off the top of the image. Like train tracks appearing to converge in the distance, the meteor radiant effect is due to perspective. The astrophotographer has estimated that there are about 50 Geminids visible in the above composite image -- how many do you see? 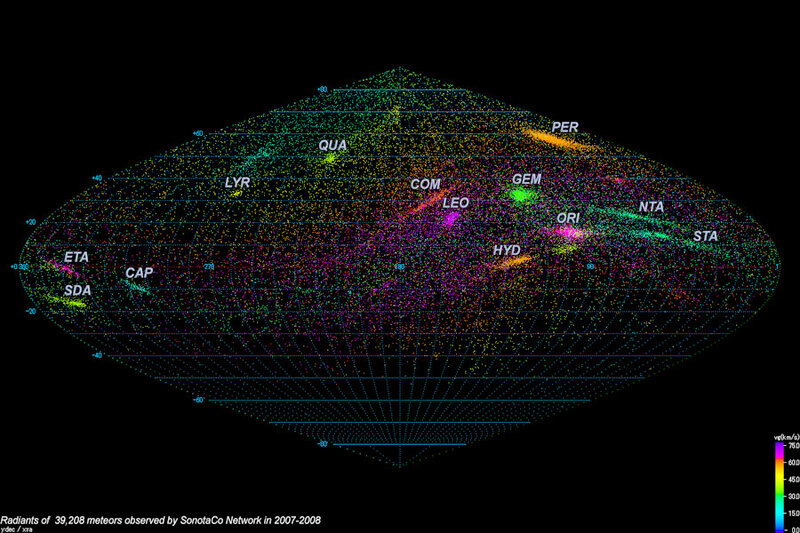 A cosmic grain of sand left the long and colorful trail across this all-sky view. Its grazing impact with planet Earth's atmosphere began at 71 kilometers per second. With the Milky Way stretching from horizon to horizon, the scene was captured on the night of November 17 from the astronomically popular high plateau at Champ du Feu in Alsace, France. Of course, the earthgrazer meteor belongs to this month's Leonid meteor shower, produced as our fair planet annually sweeps through dust from the tail of periodic Comet Tempel-Tuttle. The shower's radiant point in the constellation Leo is very close to the eastern horizon, near the start of the trail at the lower left. Bright planet Jupiter is also easy to spot, immersed in a faint band of Zodiacal light just below and right of center. The image is part of a dramatic time-lapse video (vimeo here) that began only 7 minutes before the long leonid crossed the sky. 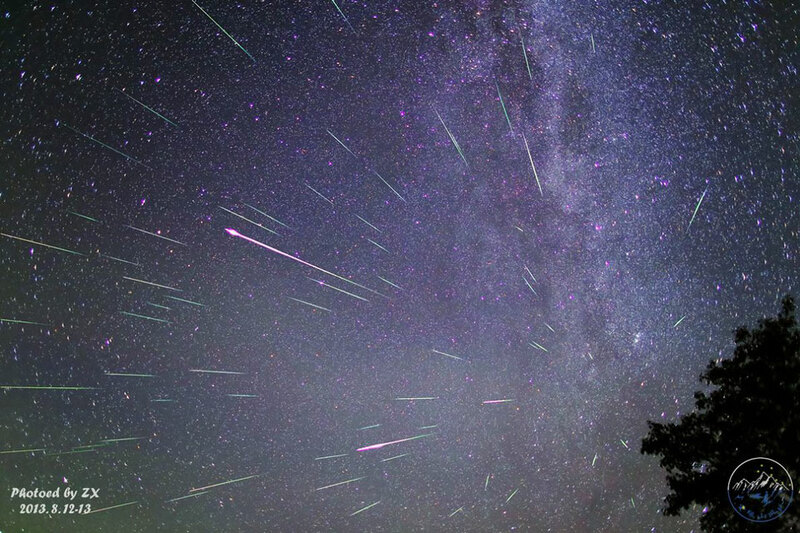 Where will the next Perseid meteor appear? Sky enthusiasts who trekked outside for the Perseid meteor shower that peaked over the past few days typically had this question on their mind. Six meteors from this past weekend are visible in the above stacked image composite, including one bright fireball streaking along the band of the background Milky Way Galaxy. 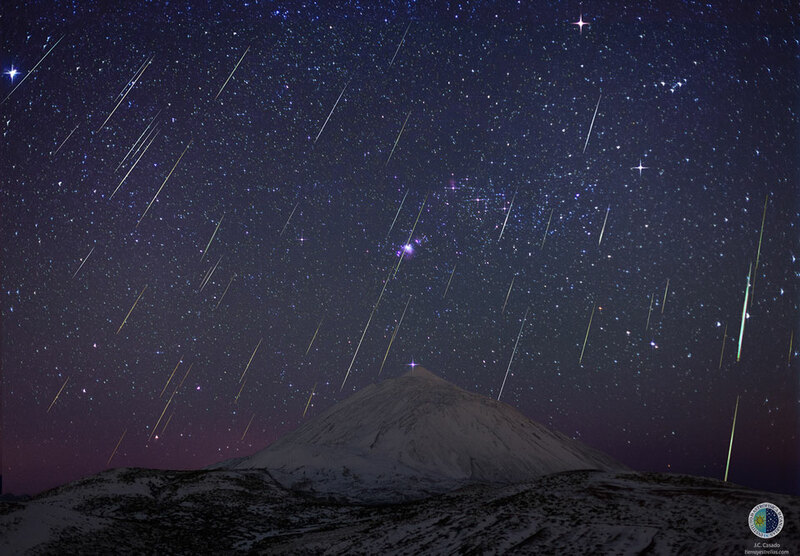 All Perseid meteors appear to come from the shower radiant in the constellation of Perseus. 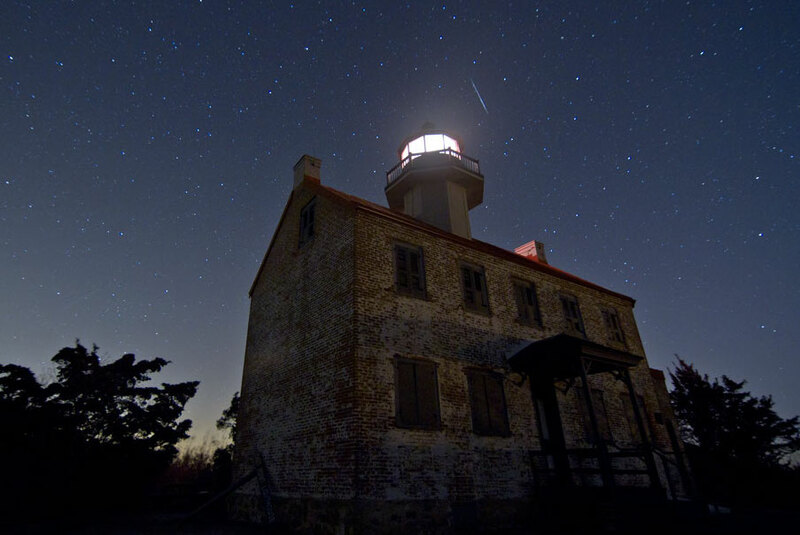 Early reports about this year's Perseids indicate that as many as 100 meteors per hour were visible from some dark locations during the peak. The above digital mosaic was taken near Weikersheim, Germany. Named for a forgotten constellation, the Quadrantid Meteor Shower is an annual event for planet Earth's northern hemisphere skygazers. It usually peaks briefly in the cold, early morning hours of January 4. The shower's radiant point on the sky lies within the old, astronomically obsolete constellation Quadrans Muralis. That position is situated near the boundaries of the modern constellations Hercules, Bootes, and Draco. Many of this year's Quadrantid meteors were dim, but the one captured in this north-looking view is bright and easy to spot. In the foreground is the Maurice River's East Point Lighthouse located near the southern tip of New Jersey on the US east coast. The likely source of the dust stream that produces Quadrantid meteors was identified in 2003 as an asteroid. What are those streaks in the sky? 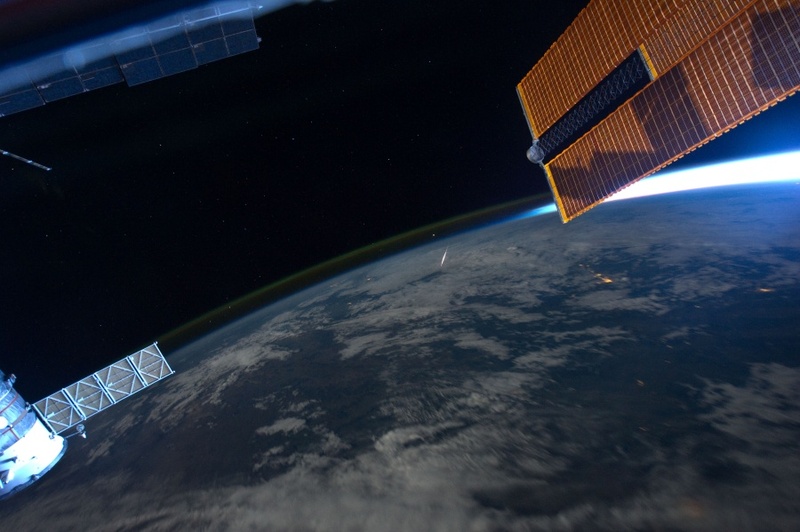 They're meteors from the Draconids meteor shower that peaked earlier this month. 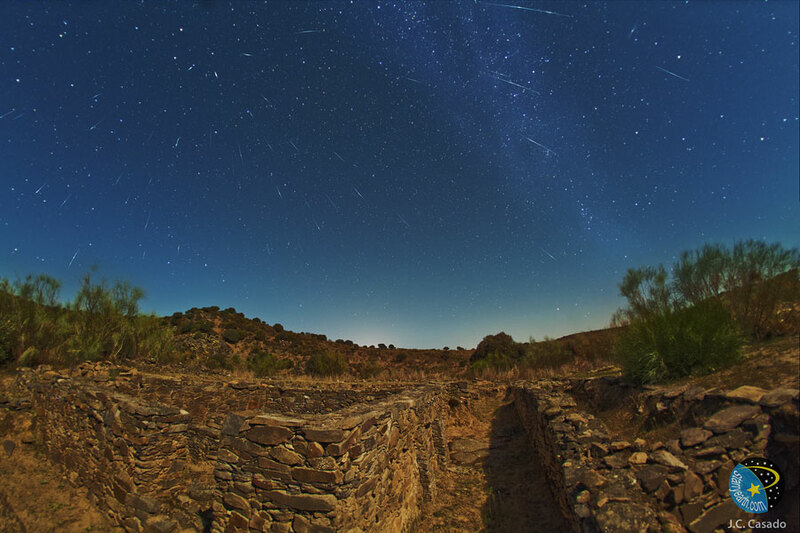 The above composite image captured numerous meteor streaks over 90 minutes above the Celtic ruins of Capote in Badajoz province, Spain. The particles that caused these meteors were typically the size of a pebble and were expelled long ago from the nucleus of comet 21P/Giacobini-Zinner. Most of the above meteors can be traced back to a single radiant emanating from the constellation of the Dragon (Draco). Reports from this year's meteor shower indicate that the Draconids were unusually good this year with activity was concentrated around 8 pm UT on October 8. The most intense Draconid meteor showers in recent history occurred in 1933 and 1946 when thousands of meteors per hour were recorded as the Earth plowed through particularly dense streams of comet debris. Although the Draconids occur every October, it is usually difficult to know just how active each year's meteor shower will be. 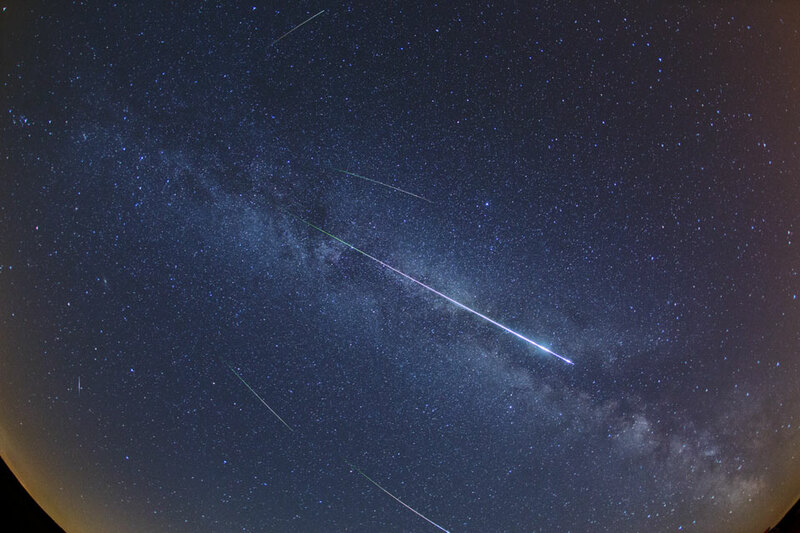 On September 1, Aurigid meteors filled the sky, in keeping with an innovative prediction of an outburst from this historically tentative meteor shower. The prediction was made by Peter Jenniskens of the SETI Institute, in work with Esko Lyytinen of Finland and Jeremie Vaubaillon of Caltech. 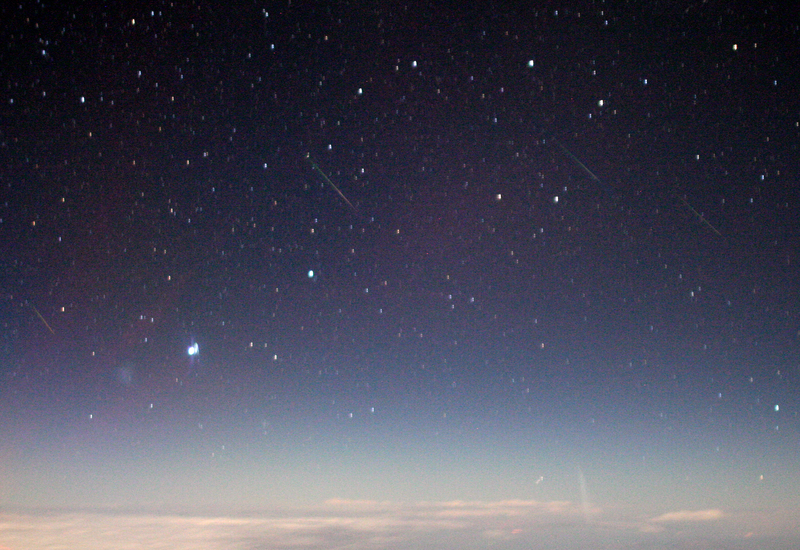 Astronomers flying at 47,000 feet on a dedicated mission to observe the outburst collected image data for this composite photo of the Aurigids' bright and colorful streaks. The source of the shower is understood to be Comet Kiess, a comet that would have swung through the inner solar system around 2,000 years ago, and again in 1911. Pushed outward by solar radiation pressure, dust from the tail of the comet has been drifting toward the Earth's orbit, creating the 2007 outburst as well as outbursts of the Aurigids recorded in 1935, 1986, and 1994. Of course, the shower's radiant point is in the eponymous constellation Auriga, the Charioteer.